Hillary Clinton has revived her campaign for the US presidency with primary election wins in three states. With nearly all votes counted, she has taken the Democratic primary polls in Texas, Ohio and Rhode Island. The results of caucus meetings in Texas are not yet known. Rival Democrat Barack Obama took the primary in the state of Vermont. Meanwhile, John McCain has won the Republican nomination with wins in all the four states. His closest rival, Mike Huckabee, has dropped out of the race and pledged to support Mr McCain's candidacy. Mr McCain's victories take him to 1,224 delegates, well over the threshold of 1,191 needed to claim the nomination at the party's national convention in September. 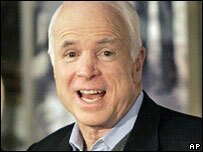 Both Democratic candidates telephoned Mr McCain to congratulate him on clinching the Republican candidacy. With 99% of votes counted, Mrs Clinton led Mr Obama by 54% of the vote to 44% in Ohio, and by 51% to 47% in Texas - the two major prizes in Tuesday's polls. The remaining votes went to other Democratic candidates who had quit the race but remained on the ballot. Speaking to jubilant crowds in Columbus, Ohio, Mrs Clinton said she was determined to stay in the race and looked forward to continuing the debate with Mr Obama "in the weeks ahead". "For everyone here in Ohio and across America who has ever been counted out but refused to be knocked out, for everyone who has stumbled but stood right back up, and for everyone who works hard and never gives up, this one is for you," she said. Mrs Clinton also pointed to Ohio's status as a state which had picked the winning presidential nominee in every contest in recent history. "You know what they say - as Ohio goes, so goes the nation. Well, this nation's coming back and so is this campaign," she said. Addressing supporters in San Antonio, Texas, Mr Obama congratulated Mrs Clinton on running a "hard-fought race" but pointed out that he still held the advantage. "No matter what happens tonight, we have nearly the same delegate lead as we did this morning, and we are on our way to winning this nomination," he said. Mr Obama also used his speech to attack Mr McCain's policies on Iraq, warning that he would lead the country on the same course as President George W Bush had followed. 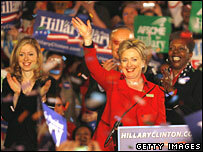 In total, according to the Associated Press, Mrs Clinton still trails Mr Obama with 1,391 delegates to his 1,477. While Tuesday's voting has not made much difference to the senators' relative standing in terms of delegates, the BBC's Vincent Dowd in Washington says that the psychological boost for the Clinton camp is huge. Mr McCain's path to the Republican nomination represents a remarkable comeback after his campaign was all but written off following setbacks last summer. Speaking to supporters in Dallas, Texas, he said the most important part of the campaign now lay ahead, in which he must "make a respectful, determined and convincing case to the American people" to pick him over the Democratic candidate in November. Mr McCain went on to outline the challenges facing the nation, including the war in Iraq and the fight against al-Qaeda and the Taleban. He also pledged a campaign that avoided "false promises", and appealed for voters to "stand up and fight for America, for her strength, her ideals and her future". He will go to the White House on Wednesday for lunch with Mr Bush, when he is expected to receive the president's endorsement. Conceding the race at a rally in Irving, Texas, Mr Huckabee said: "It's now important that we turn our attention not to what could have been or what we wanted to have been but what now must be, and that is a united party." For the Democrats, a total of 370 delegates to the nominating party convention in August were at stake in Tuesday's four races, to be divided proportionally. So far, Mr Obama has gained 13 delegates in Vermont to Mrs Clinton's seven, not including super-delegates. With most of the votes counted in Ohio, Mrs Clinton has gained 75 delegates to Mr Obama's 60. Mrs Clinton has won 20 delegates in Rhode Island and Mr Obama has gained 10. In Texas, so far Mrs Clinton has gained 37 delegates to Mr Obama's 24, with 193 delegates to be allocated in total. The results from the Texas caucuses - meetings at which voters gather to indicate their support for their chosen candidate - have not been finalised, so the final delegate count is not yet known. Between the nationwide Super Tuesday contests on 5 February and the 4 March polls, Mr Obama won 11 contests in succession, giving him a lead over Mrs Clinton in the delegate count and apparently unstoppable momentum. The economy was the most important issue for Democratic voters in all four states, especially Ohio, according to exit polls. The Iraq war was a close second in Vermont. Those polls also suggested Mrs Clinton was doing well among white, blue-collar and older voters in Ohio, which may indicate she has halted Mr Obama's advance into those groups, her core base until recent contests.